So, Stephen Hester has declined his £1m bonus. Well done. This morning’s radio comments on the issue have been revealing and need a more robust response. Though I give credit to Evan Davis again for challenging one interviewee who suggested that firms need to be able to pay on the basis of desert. Davis came back very quickly and said that the logic of capitalism was that firms try to get labour as cheaply as possible. Only senior managers seem to think that they deserve high salaries. Stephen Hestor, noted Robert Peston on the Today programme, is a ‘determined man’ who may find himself with job offers to go to other banks where he could claim his bonus without political interference. Here are the things to say to all of those senior bankers – and anyone else who thinks that they deserve more. Go. If you can find a better place to live than London, go. Second, having got us into this mess, you might feel that you have some responsibility to help clean up the mess. The banking sector owes the taxpayer a lot of money and gratitude. There wouldn’t be a banking sector without us. Go to Beijing, Singapore, Dubai. We really need a reformed banking sector – one that serves the citizens rather than exploits them. We want small businesses to be able to function and develop. Banks, as they are currently manifested, are a hindrance. Finally, I have heard the argument that we need Stephen Hestor so that we can return the bank to the private sector and retrieve the £45bn or so that we have invested. At the moment it is ‘worth’ half of that. The experience from Northern Rock is that we will not get our money back with or without Stephen Hestor with or without his bonus. Travel is great for contrasts. In many respects Germany, for example, is a highly regulated country. It is very difficult to do some things that normally I take for granted in the UK. Online mobile phone top-ups are a case in point; likewise trying to get mail sent to an address that one is not officially registered at. It is very frustrating. With that in mind, I still find it very strange that the Germans still allow cigarette advertising. 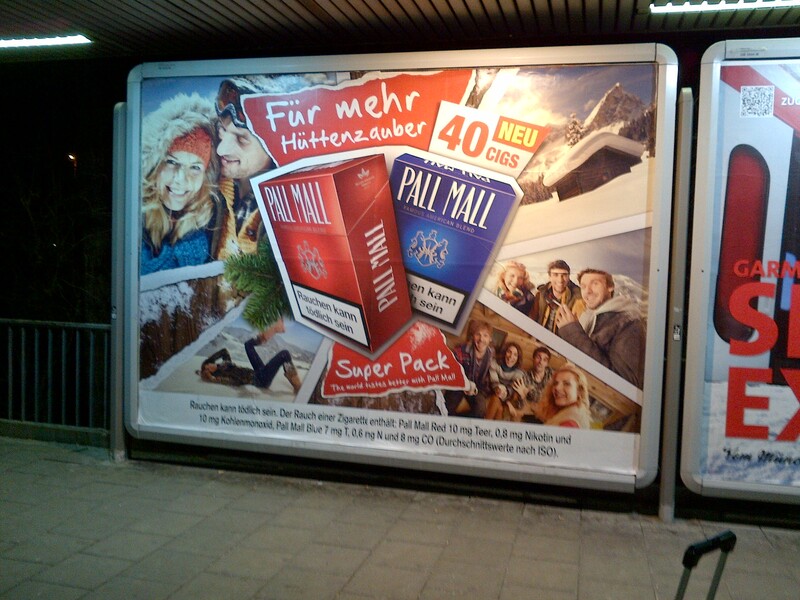 This one for Pall Mall can be found on all railway stations in Munich and maybe elsewhere. It depicts a group of beautiful young people in the Alps (presumably skiing) killing themselves with cigarettes. This is a new thread. Since getting a van, I am conscious about headroom, particularly in multi-storey garages (park houses). It really is a problem. My van is 1.9 metres. Gatwick Airport south terminal short stay. Two things to say here. Headroom is 1.95 metres. The van fits okay. Recently, the entry has been modified to make the 90 degree turns easier. Well done Gatwick. Hull Premier Inn – now visited. The undercover car park has a 2m restriction, but there is an un-covered car park with no restrictions. I can recommend the Kingstown hotel, about 2 miles further east down Hedon Road. Comfortable with free wi-fi and no headroom restrictions. Readers of this blog know that I live in a housing co-operative where all members input into the management of the enterprise. Like all forms of organisation, it is imperfect. The structures that facilitate equitable governance can seem bureaucratic. But once established all members have resort to them and unless everyone agrees that they should be changed, they guide the collective towards prudent and non-exploitative management. Not surprisingly in these recessionary times, co-operatives are very much in the news. Not just in housing, however. Co-operative businesses are much discussed even by this wretched government as a bulwark against forms of capitalism. One can always hear about the John Lewis model without actually understanding what that means. (John Lewis, arguably is a very special example of a co-operatively-owned business.) The capitalists resist co-operative principles because they cannot extract the profit as a dividend. In the days of de-mutualisation of building societies, these people resorted to ‘carpet bagging’ and rewarded us with Northern Rock. None of the demutualised buidling societies now survive. All have been absorbed into failed or failing banks. Halifax became HBOS, Abbey National had to be ‘rescued’ by Santander (Alliance and Leicester and Bradford and Bingley, too). 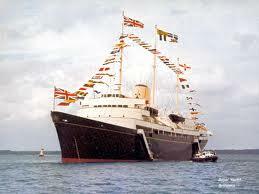 A tear was in Her Majesty’s eye when the Britannia was decomissioned back in 1997. Prince Charles clearly likes the idea of a new Royal Yacht for himself his mother. And being apolitical as he is, he’s been lobying the government for it. Thank goodness for Michael Gove and David Willets supported by the Daily Mail to put this vital issue on the agenda. The Diamond Jubilee – only the second one in world history – should be remembered more than the Olympic Games in 2012. A new royal yacht is clearly the best way to do this. Today, 22 January 2012, the Observer is running the story about how this bid for a new yacht was orchestrated. No co-incidence, it seems, that this was raised at this time. There are many issues. Even if there are no tax receipts used to fund this ship, the list of backers suggests that we should have a little concern. The focus on the educational value, is a case in point. Primarily, goes the argument, the ship will be a training vessel for underprivileged young people to learn a seafaring and develop teamworking skills. That is why, no doubt, Pearson Education, owners of Edexcel, the skilled company that sets impossible exam questions for 16 year old students and briefs teachers on exam content, is a big supporter. (Why have public qualifications been privatised?) The Queen’s representative in Hampshire [does she need a representative in Hampshire?] Rear Admiral David Bawtree, also a director of Visor Consultants, a private security firm, is the man behind the project called FSB21. Not forgetting also that Tony Blair, the man who decommissioned Britannia, now regrets the decision. He’s got a bob or two, these days. Notwithstanding all of that, fine, if they want another Royal Yacht, go ahead. Amongst that lot, there is enough money for sure. But why not just be honest, it is a floating hotel for the elite. The spin is nauseating. And please make sure that you have enough to maintain it. So often, taxpayers are left with the bill. David Cameron made an appearance on the Today programme on 6 January 2012 and once again defended his veto at the EU. Clearly his position has not changed, but Evan Davis did stress once again his own perplexity when it comes to what was actually achieved. The recording can be found here. 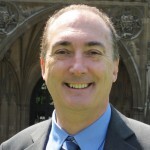 My Conservative MP, Mike Weatherley (pictured), is quite a self-publicist. He ‘sends’ me his monthly newsletter in his quest to inform and influence. Increasingly this newletter is used to express his uninformed prejudices which I am increasingly offended by. I am sure that I am not the only one he offends in his constituency. I want to use my blog to make clear to him and others that he rarely represents my interests and I do not want to be associated with his intolerence. Having recently been successful with my campaign to criminalise squatting, I have also taken the campers on Victoria Gardens in Brighton to task. Long-term camping in public spaces as a form of protest is unacceptable. The point of the protest was made long ago and it’s now just about a group of lazy campers hanging around for a fun time in front of our Royal Pavilion. This is not something that the public should have to pay for or put up with. Hard working taxpayers have had enough of these freeloaders. After publicly condemning the camp, I popped down to put my concerns to them in person. They claim to represent “the 99%”, so I informed them of the views of the REAL 99% – and told them to tidy up and go home. Readers of this blog will know that I have posted on the subject of squatting before. Mr Weatherley is quite clearly a fan of the housing Minister, Grant Shapps, who ineptly equates squatting and murder. Mr Weatherley, some of us owe our homes and wellbeing to squatters. The country as a whole owes much to the squatting ‘movement’ such that it is. Moreover, there are not too many bulwarks against the property owning class that Mr Weatherley’s elitist party celebrates. Squatting is one of them in its demonstration of the inequity associated with housing that is a malaise in our society. And I suspect that Mr Weatherley, like the housing minister, Grant Shapps, thinks that he is protecting people who find their houses squatted after they have been away on holiday or business. I do not condone this, but this is rare. Most squatting is targeted at criminally empty properties that can and should be brought into habitation, preferably under some collective ownership and/or management. I would have thought that was a better use of his time, criminalising empty property. Mr Weatherley seeks to criminalise expressions of liberty and freedom in the name of protecting it. There is more to say about Mr Weatherley. 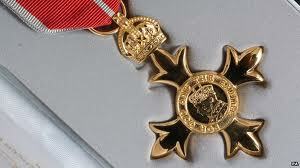 It is that season again, the New Year’s Honours List. What is it really all about? Okay it is about honouring people who have achieved distinction in the arts, learning, science and public service. I know. But even then, golf: Rory McIlroy MBE aged 22 and Darren Clarke. Come on! Sport more generally. Then call me a cynic, we honour Gerald Ronson, former felon turned good guy (for subsequent charity work). Then there is Peter Bazalgette for bringing Big Brother to our screens – is notoriety on the list of qualifications? Hedge fund manager and Tory donor Paul Ruddock. Well done!